It’s time to take a look at another one of the Christmas games. Shantae was definitely a lot of fun to play through and it’s an indie game done right. It’s not super long or anything since it’s a game that is made to be speed runned, but it’s still long enough for you to feel like you got your money’s worth. The level designs are all on point and the game just looks and sounds good in general. I can also finally say that I’ve played a game in the Shantae series! Shantae was trying to enjoy her beauty sleep when the village has need of her services once again. 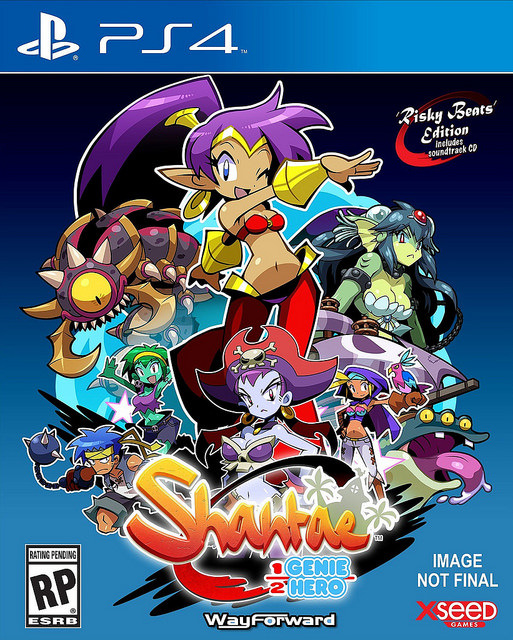 As a half-genie hero, Shantae protects a village and in exchange they pay her or at least give her a place to live. Unfortunately, the mayor has a habit of firing her. The village is attacked by all sorts of villains, including Risky Boots. Shantae will have to take them all down and save the genie realm, but can she do it? The game has a nice retro feel to it as the game uses sprites the whole time. The levels are all pretty bright and cheerful. Even the villain levels and burning remains are still bright enough for you to see where you’re going at all times and breeze through. The game has that simple fun factor that the Mario and Sonic titles of the past possessed. It’s something that some games tend to lack nowadays with their artificial length and unnecessary quests. This one had a few riddles that needed to be deciphered, but they weren’t anything too crazy. I found them all in a reasonable amount of time. Ironically, I managed to find most of the bonus collectibles in the mean time. By the time I was able to get to the next story level, I was very overpowered. I had a large heart collection by then and a lot of power ups that made the rest of the game a breeze. Naturally, all of these collectibles help the replay value section. The main game should take around 5 hours or so, but in order to get the Platinum Trophy, you’ll need to play the game again and complete it in a mere 4 hours. Certainly doable, but it’ll take some practice and a nice plan in mind. This is a game where I actually do plan on getting all of the trophies sooner than later so stay tuned for that. I’ve already got 72% of the trophies and more are on the way. The music selection in the game was certainly enjoyable. The song that played during the first level was definitely a lot of fun and so was the boss theme and the burning cafe. They helped make the game more exciting for sure. This game definitely really succeeded on a technical level as well as when it comes to the pure gameplay. The creators definitely put a lot of heart into it and I can see why the kick starter people would feel good about their contributions. As for the gameplay, it starts out like a classic Mario game, but with her hair acting as a sword of sorts. As you play through the game, you’ll get gradually stronger to the point where the old levels will suddenly be a piece of cake. You’ll learn how to fly, swim underwater, grab onto ceilings, and also multiply your attack power and speed by 4x. It’s fun to see the contrast to the start as you really begin to breeze through all of the levels. It’s hard to believe just what a difference the power ups make, but they are well worth it. As mentioned before, the level designs are really good, which help to further make the gameplay shine. The only part of one level that seemed a little overly difficult was the Flappy Bird homage in part 3 of the last level. Luckily, you can cheese it out by falling on the very left of the final spike platform and then turning into a Bat. I somehow think that this wasn’t intentional, but we certainly take those. Anything goes when it’s time to complete the game right? Shantae makes for a good main character. She reminds me a lot of Lina Inverse from Slayers, but less obsessed with money and riches. Shantae’s just a noble hero who tries to do the right thing and save the day. She even takes time out of her day to chat with the villains when they’re not busy trying to rule the world or resurrect old pals from the previous games. There are a lot of references to the older games, but it’s certainly not necessary to purchase them to understand what’s going on. You’ll be able to get into the game rather easily. Shantae’s grandfather and two friends aren’t that charismatic so I don’t mind that they got a rather small role. This is one of those games that really leans on Shantae as she has the most personality by far. Risky Boots does the same for the villains. She seems to be the only villain who is totally evil and doesn’t have time for niceties or cracking jokes like the others. Her plan was actually pretty intense and if you get the bad ending, she does succeed in destroying quite a few people. Naturally, I went for the bad ending since the good one needed me to grab more collectibles. I’ll probably see that one when I attempt the speed run at some point. If not, well..I can probably tell what will change anyway, but you’ll just need to find out for yourself. The sheer fun factor of the game ends up putting it ahead of Shovel Knight and Mighty No 9. There is a lot of backtracking here and helping people out with side quests, but they were all fun to play through. The levels are also short enough where it isn’t a bother to go back and forth as you look for collectibles. It’s just a very well made game and if I were to have any complaints, it would be that you can’t skip the credits, but I suppose that’s cool for the people who pledged to this project. Overall, Shantae Half-Genie Hero is definitely a good PS4 game and I’d recommend picking it up. It’s certainly not the longest game on the block, but it’s long enough and has a good amount of replay value. If we do end up getting some free DLC for it soon, that’ll be even cooler, but there’s enough base content to make it all worthwhile. Sprites also work perfectly for the game since otherwise the dancing and attires could be a bit much in this desert land, but sprites make everything 20% better. Hopefully this game did really well so we can get a sequel at some point. Of course, if Shantae is added into the Switch version of Smash, then she’ll have enough publicity to last a life time! This entry was posted in 8 Star Games, Game Reviews, Games, Reviews and tagged Game, Game Review, Genie, Indie, Indie Game, Magic, Platformer, PS4, Review, RPG, Shantae, Video Game Review by dreager1. Bookmark the permalink.